HILLSBORO, OR--(Marketwired - Jul 15, 2014) - Lattice Semiconductor Corporation (NASDAQ: LSCC), the leader in ultra-low power, small form factor, customizable solutions, today introduced the iCE40 Ultra™ family, delivering unsurpassed integration of emerging infrared remote, barcode, touch, user identification, and pedometer functions with ample customization capabilities for makers of mobile consumer devices to quickly implement 'killer' features that differentiate their products. iCE40 Ultra FPGAs deliver 5x more functionality at 30% smaller size than competing solutions. Lattice has also reduced power by 75% over previous devices. Combined, these enable designers to give their systems more compact form factors and longer battery life. Lattice has shipped hundreds of millions of iCE40™ FPGAs since their introduction in 2012, providing the fastest time to market for a diversity of capabilities in smartphones, tablets, wearables and other mobile devices. "Lattice's new iCE40 Ultra family further frees designers to customize any way they want in order to win big in their markets by implementing amazing features their customers can't live without," said Lattice Semiconductor President and CEO Darin Billerbeck. The iCE40 Ultra family integrates LED drivers, multipliers and accumulators, serial interfaces and a whole host more of hardened IP. This ASSP-like integration reduces system power and speeds implementation so designers can spend more time on the customization. With the smallest iCE40 Ultra device in a WLCS (wafer level chip scale) package measuring just 1.7mm x 2.1 mm x 0.45 mm, no other solution on the market delivers so much capability and flexibility at low power in such a small package. 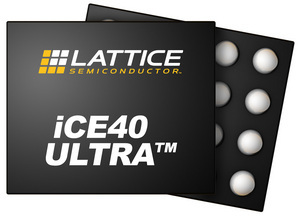 iCE40 Ultra family devices are available from Lattice now. Software support is available in the Lattice iCECube2™ tool. For more detailed information, please visit www.latticesemi.com/iCE40Ultra. Lattice Semiconductor (NASDAQ: LSCC) is the world's leading provider of ultra-low-power customizable solutions for makers of smartphones, mobile handheld devices, small-cell networking equipment, industrial control, automotive infotainment, and much more. With more than 1 billion units sold over the past 10 years, Lattice ships more FPGAs, CPLDs and Power Management solutions than any other programmable solutions vendor. For more information, visit www.latticesemi.com. You can also follow us via Twitter, Facebook, or RSS. Lattice Semiconductor Corporation, Lattice Semiconductor (& design), L (& design), iCE40, iCE40 Ultra, iCEcube2 and specific product designations are either registered trademarks or trademarks of Lattice Semiconductor Corporation or its subsidiaries in the United States and/or other countries. Lattice Semiconductor's iCE40 Ultra FPGAs deliver 5x more functionality at 30% smaller size than competing solutions, while reducing power by 75% over previous devices.